Most mums who set up their own home business or do flexi-hours working from home know it can be incredibly difficult to maintain self-discipline, especially if they are used to working in a structured office environment. With nobody to tell you what to do and only self-imposed deadlines, it can be difficult to resist the temptation to put in another load of washing - or watch just one more episode of your favourite daytime telly programme. People who manage to make self-discipline an integral part of every day, however, are the ones who have the most satisfying work life – and, ultimately, make the most money. But how can you make sure that you actually utilise the time available to its best advantage, and not fritter it away on mundane activities such as reading that novel, or having just one more cup of coffee? Luckily, there are tried-tested rules for working from home that really do work – and will help keep you on the right track. Even if you think you're an innately disorganised individual, there's no need to fret. Discipline can be taught – and it's a lot easier than you may think! Rule No 1: Set a specific time aside each day to work. When you first start out, it may be easier to slowly build up to a regular schedule. If you drop the kids off at school, give yourself an extra half hour or hour for coffee with friends before you begin. Start working from 10am to 2pm, with a short lunch break. Build up to a longer working day. Rule No 2: Keep all distractions to a minimum. It can be impossible to work if friends keep phoning up for a chat and the children are banging on your office door to get your attention. Investing in childcare may soon become a priority if you children are below school age. Rule No 3: Don't allow yourself to get side-tracked. Who cares if there are 12 loads of washing to do, and the kitchen's a tip? If you were in the office, you wouldn't take time off to tidy up the children's bedrooms, would you? So don't do it during your working day! Similarly, avoid surfing the Net for fun or sending emails to long-lost friends and relatives. Putting aside time in the evenings for fun that's not work-related can make all the difference. Rule No 4: Have a goal set out each day you want to accomplish. 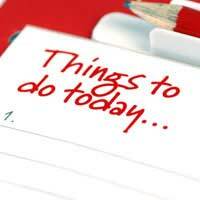 When you finish work for the day, take five minutes to write yourself a brief to-do list for the following morning. You may want to send out five emails to clients, type up a brief or make three sales. Whatever your goals, make sure they are set in concrete – and fulfil them. Rule No 6: Reward yourself when you have accomplished specific tasks as a form of motivation. In an office environment, your boss will give you a pat on the back for work well done. At home, you're the boss – so reward yourself with plenty of healthy pats in the form of an hour off to go shopping, time to get a new haircut or a treat with the kids after school. Work hard, play hard – you deserve it! Keeping up a decent workload on your own can be tiring. You may think it's impossible to be productive without someone cracking the whip, but the truth is quite the opposite. Exercise. Not only will this make sitting in front of a computer for hours more bearable, but getting those endorphins going can give you the head space to plan your day more productively. Take a day off. Didn't you ever pull a sickie when you were fully employed? Maybe you did because without an occasional day off, your productivity would falter. It's okay to do the same when you work from home. Just don't do it too often! Make evenings fun. Working 28 hours a day can cause burn-out, but it can be overly tempting to work for an extra hour or two if your office is next door to your kitchen. So divide your day into work and play times, and make every evening fun without completing too many tasks. All work and no play makes Jill a dull girl! Working mums in particular often find working from home difficult at first. After all, we are usually queens of the castle – and keeping the castle in tip-top shop is also a priority for us.